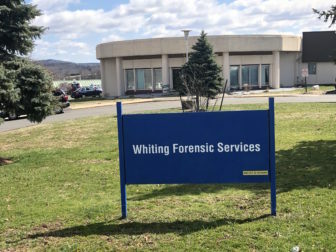 Whiting Forensic Services at Connecticut Valley Hospital (CVH) is transitioning to its own stand-alone hospital, separate from CVH. More than a year after the repeated, cruel abuse of a Whiting Forensic patient was captured on videotape, the state Senate unanimously approved a bill that would create an independent task force to oversee the maximum security psychiatric facility and would make staff there and other state behavioral health facilities subject to fines or even criminal charges if they fail to report abuse. The bill also codifies the separation of Whiting from the Connecticut Valley Hospital (CVH) in Middletown (a change the governor already has made through an executive order). It also requires the state Department of Public Health (DPH) to conduct an extensive on-site inspection and review of records at Whiting, which is overseen by the state Department of Mental Health and Addiction Services (DMHAS). 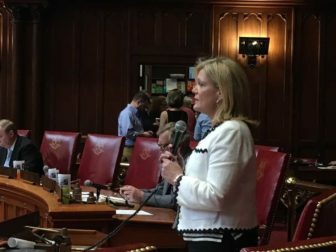 “For the state of Connecticut, I think this is a really good first step,” said Sen. Heather Somers, R-Groton, Senate Republican co-chair of the Public Health Committee. DMHAS spokeswoman Mary Kate Mason said the department supports the bill, which in its final form combined several bills regarding Whiting that were passed out of the Public Health Committee. Hours of recordings showed Whiting patient William Shehadi Jr., now 59 years old, being repeatedly kicked, hit and tormented by staff in February and March 2017. As a result, 10 staffers were arrested and 37 were put on paid administrative leave. Thirty-six of the 37 have since “separated from state service,” according to DMHAS. Sen. Terry Gerratana, D-New Britain, speaks about the Whiting bill. In March, Shehadi’s brother, Albert Shehadi, filed two lawsuits on his behalf — one against the state and the other against 12 of the forensic nurses and treatment specialists whom the suit charges carried out the abuse. This is not the first time Whiting and Connecticut Valley Hospital have been scrutinized. In 2007, the U.S. Department of Justice released a scathing report, finding that CVH failed to provide its patients adequate protection from harm, adequate psychiatric and psychological care and treatment, and adequate discharge planning and placement in the most integrated setting. Under the bill and the executive order, beds at Whiting will be consolidated with those at CVH’s Dutcher Enhanced Security building, creating a 229-bed stand-alone forensic hospital. As such, the public health department would be required to scrutinize operations at the facility at least every two years — or whenever a complaint arises. An office of inspector general? The new task force would be charged with reviewing and evaluating the operations, conditions, culture and finances of Whiting, as well as CVH. It also would evaluate the feasibility of creating an independent, stand-alone office of inspector general responsible for overseeing CVH and Whiting. Somers said this evaluation is needed because “of the culture of cruelty and reprehensible reports of abuse at a state-run facility which had been allowed to remain hidden in the shadows of secrecy for far too long. “An inspector general will bring transparency and reformation that is necessary to restore confidence in the services delivered by the state,” she said. 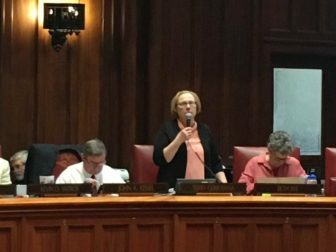 Sen. Heather Somers, R-Groton, summarizes the Whiting bill. The office’s responsibilities would include investigating complaints concerning CVH and Whiting employees, and evaluating the need to conduct a confidential survey regarding the employee work environment at CVH and Whiting, including worker morale, management and any incidents of abuse and neglect. The task force will be required to make a preliminary report of its finding and recommendations to the legislature’s Public Health Committee no later than Jan. 1, 2019. A final report would be due no later than Jan. 1, 2021. The task force would terminate on the date it submits the final report. The bill requires DPH to inspect Whiting by Jan. 1, 2019, and review the hospital’s operating protocols and procedures, documentation of employee training, any complaints against the hospital or an employee, and any allegations of abuse or neglect of a patient. The public health commissioner must report the findings from that review to the task force with 30 days. There is currently no criminal penalty for failing to report patient abuse in DMHAS behavioral health facilities. Under the bill, a mandated reporter that fails to make a report faces a fine of up to $500. If the failure is intentional, the employee would be guilty of a class C misdemeanor for the first violation and a class A misdemeanor for any subsequent violations. Medical and direct-care staff would be mandated reporters. According to the legislature’s Office of Fiscal Analysis, DMHAS will need to hire staff for Whiting. The anticipated cost to support thirty employees (including behavioral health clinical managers, advanced nurse practitioners and pharmacy staff) is about $1 million in fiscal year 2019 and $3.1 million in fiscal year 2020, with associated fringe costs of of $363,300 in 2019 and $1.1 million in 2020. Whiting staffers generally care for patients with psychiatric disabilities, some of whom have been found not guilty of a crime by reason of mental disease or mental defect. Those acquitted of a crime fall under the jurisdiction of the Psychiatric Security Review Board (PSRB). Shehadi was committed to the PSRB in 1995 after being acquitted because of his mental illness in the killing of his father. He has been involuntarily committed to state custody ever since.